Contrary to popular belief, most Dachshunds are not good with very young children. Dachshunds come in two sizes, mini and standard. Although not recognized by AKC, dogs in between the mini and the standard are referred to as "tweenies". Having a Dachshund in a home where there are birds, rabbits, and chickens is not a good idea. Dachshunds are prone to back problems due to their long spine. Climbing stairs on a regular basis could increase the chance of back problems. Jumping off furniture can also increase the chance of back problems. Dachshunds love to eat and will eat more than they should, if allowed. Letting your Dachshund become overweight is unhealthy and could increase the chance of back problems, knee problems, and heart problems. 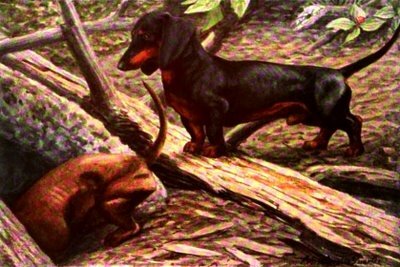 Dachshunds live an average of 12 to 15 years. Therefore, adopting a dog at the age of 7, 8, 9 or older will still give you plenty of time with your Dachshund. Senior Dachshunds need a loving home as much as the young ones. Dachshunds are very smart and very stubborn. If you are looking for a dog that will obey your every command, this is not the breed for you. Dachshunds love to cuddle and curl up in your lap. Dachshunds are barkers and can cause problems in an apartment setting if left alone. Like all dogs, if they are bored, they can be noisy and destructive. Dachshunds like to burrow. Most Dachshunds prefer to sleep in bed with their people under the blankets. Dachshunds are very social dogs and are better in pairs. Not many Dachshunds like being the "only dog". They are also prejudiced and prefer dogs of their own breed. Are you having behavioral issues with your dachshund? ​Is it aggressive to other dogs? Won't listen? Check out Cesar Millan's dog psychology center at www.trainingcesarsway.com. And be sure to watch "Cesar 911" on the Nat Geo Wild channel every Friday night. Your dog will thank you and you will be a happier dog owner.